The world has its first robot news anchor. Nippon Television, the Japanese TV network, has hired Erica to deliver the nightly news. Erica is a highly advanced robot. 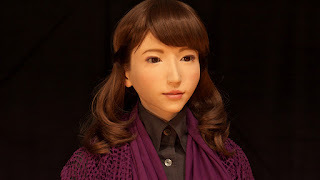 It was developed by the Director of the Intelligent Robotics Laboratory at Osaka University, Hiroshi Ishiguro. He says Erica has one of the most advanced artificial speech systems in the world. The news robot is loaded with the latest tech. It's capable of holding conversations with humans thanks to speech generation algorithms, facial recognition technology and infrared sensors that track faces across a room. This robot is no joke. Erica actually likes to tell jokes. For now, she'll serve as a news reader. No on-the-road reporting assignments yet but that can't be too far behind on a potential channel called Robot News Network (RNN).